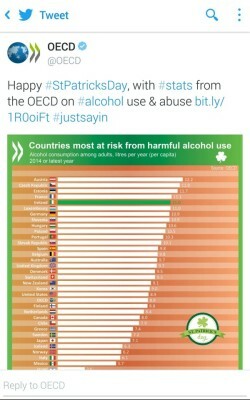 THE OECD, ONE of the largest and most influential think-tanks in the world, has apologised for a tweet about St Patrick’s Day which contained statistics on alcohol abuse. The accompanying chart ranked Ireland as joint fifth in the world for alcohol consumption among adults per year, behind Austria, Czech Republic, Estonia and France. The tweet was widely criticised on social media for linking St Patrick's Day solely with alcohol abuse. It was deleted within approximately one hour of being sent. "Deeply inappropriate and reductive tweet on a day celebrating all aspects of Irish culture and history," wrote Tomás Ó hábhartaigh on Twitter. Dan Morrison, the head of media at the OECD, told TheJournal.ie this evening: "It was not a tweet that we were proud of." "We got this one wrong," he said. "We sincerely regret any offence that it caused." The OECD is not the only organisation which has faced problems with the tone of St Patrick's Day tweets. Earlier today, Lewisham police in south London apologised and deleted a tweet which depicted a four leaf clover made out of handcuffs.